Walter and Lydia Hardy were, by all accounts, the proper socialite couple. Living at an upscale address in Queens, Lydia kept house (managed the housekeeping staff) and played socialite while her husband travelled for work. Walter was in sales, or at least that’s what they told Felicia. In reality, Walter was the infamous cat burglar known as the Black Cat. And his daughter absolutely adored him. When Walter was finally caught and imprisoned, Lydia told their daughter that her father was killed in a plane crash over the Andes Mountains. Felicia was devastated. Lydia had been raising Felicia mostly by herself at this point, but the girl truly enjoyed the brief times her father would spend with her. It was years later before Felicia would learn the truth about her father. It wasn’t from her mother, but through piecing together news articles that Felicia matched up high-profile thefts to her father’s ‘business trips’. After she was mugged, Felicia decided to enroll in a self-defense class. She later studied karate from an Okinawan master. And on the side, perhaps out of some inner deference to her father, she taught herself how to pick locks and safes. Felicia was a freshman at Liberty University when she was date raped by Ryan, her boyfriend at the time. Afterward she was horrified and ashamed and furious all at once. She had never felt like a victim before, not even when she was mugged. Vowing revenge, she trained all the harder and learned different styles of martial arts. When she was ready, Felicia went to look for Ryan. She intended to kill him for what he had taken from her, she discovered that he had died in a car accident. Frustrated and unable to exact her revenge, Felicia took to another source as an outlet. She gathered some tools of the trade, had a costume made, and took up her father’s mantle as the Black Cat to start a life of larceny. She wanted to do the name justice, and so she took to setting elaborate ‘traps’ in case she was caught by guards. And initially she was, at least until the traps went off. “Bad luck to let a Black Cat cross your path!” she’d always cry out as she escaped. And so she built her reputation. When the Spectre’s curse was lifted, Felicia felt the effects almost immediately. A latent metagene manifested to give Felicia enhanced senses, an enhanced physique, and a probability affecting ‘bad luck’ ability. It took a little while to get used to her new abilities, and Felicia was elated. Moreover, she began really pushing her luck. Taking more and more daring jobs to sate the rising need for danger, Felicia wasn’t really paying attention when her reputation eclipsed that of her father. Felicia is a -terrible-flirt, she can't help it. She'll flirt with anyone, anywhere, with the least little provocation. And if her costume doesn't draw attention immediately to her bountiful bosom, she's likely to say something saucy to encourage the distraction. Not only is Felicia not afraid of risks and danger, she goes out of her way to find them. The adrenaline rush feeds her addictive personality, making her look for bigger thrills next time. Felicia tends to have a possessive personality, whether something (or someone) belongs to her or not. Sometimes she steals something because it seems like a good idea at the time, only to wrap it up and stuff it into a closet once she has it. She doesn't NEED to sell everything for cash and she certainly doesn't keep everything for sentimental reasons. Sometimes she just doesn't want other people to have them. Felicia's temperamant is as fickle as a… well, she's fickle. She could be happy and playful one moment then ready to scratch your eyes out the next. Sometimes it takes seemingly nothing to set her off, although there's usually some little nuance that she picks up. Felicia has had numerous boyfriends… and girlfriends… in her short life. She's not the sort to commit to a relationship, following her heart and more often her libido headlong into things without thinking longer term. This, combined with her 'Thrill Seeker' mentality often makes for a lot of trouble for the Cat. As far as killing goes, Felicia isn't at all squeamish about it if there's no other option. But killing is never her first solution. Felicia's motivation can be pretty well wrapped up with her other Psyche characteristics. She's always looking for something pretty to steal, the more dangerous and challenging the better. She wants to keep her ego stroked, and she's on a never-ending search to fill the void in her soul with material things and earthly pleasures. While Felicia would never ever in a million years admit it, she is looking for a purpose. Stealing and thrills are good for a quick rush, but she's always left feeling empty again. What she subconsciously wants is a higher calling, a more noble use for her skills. Well perhaps 'noble' isn't the right word. Felicia would never describe herself as a hero, and she'd honestly just as easily work for the right kind of bad guy as alongside a group of heroes. It all depends on which would be the most fun. When Spectre's curse lifted it triggered a latent metagene in Felicia, causing her to manifest certain feline abilities as a result. Felicia's sense of balance and her agility were elevated above peak human levels, giving her superhuman reflexes as well. Her strength increased to proportionately feline levels, along with her endurance. So in addition to being quicker than normal humans she can leap up to five times her height and sprint up to 30 mph for short distances. Lastly, her nails have changed. While the outward appearance hasn't changed they can extend into talons and retract like the claws of a cat. The claws are about as much use as those of a big cat, suitable for climbing many surfaces as well as for fighting. With her latent mutation, Felicia picked up the ability to psionically affect probability fields in a limited manner. This allows her to create improbable, if not impossible 'unlucky' things to happen to someone within her line of sight. The power is limited to affecting probability for others, and only in a negative manner. When her metagene triggered, it also enhanced Felicia's senses. Her vision now extends into the infrared spectrum, allowing her to see heat signatures and other infrared radiation. She can pretty effectively see in the dark, much like high-quality military night vision equipment. Felicia can also smell pheromones that are below most humans' threshold of awareness. Felicia's parents, Walter and Lydia Hardy were always wealthy as far back as she can remember. Her mother played the socialite while her father practiced his craft as the notorious burgular, the Black Cat. With her father dead and her mother reclusive, Felicia retains access to the family fortune that she occasionally supplements with her own high-end burglaries. Being New York's premier cat burgular has developed more than a few criminal contacts for Felicia. Between competitors, fences, and informants she's well connected with New York's larceny support community. Felicia's tight leather costume was custom made to fit her, offering moderate protection as well as emphasizing her more distracting assets. Sleek black leather blends into the night, soft-soled boots providing quiet traction. The fur trim along the forearms conceals grappel lines that Felicia can fire to attach to a building ledge or something similar. These were originally designed by her father, Walter. She can use them to swing between buildings, scale walls, or lower herself down from a skylight. And of course the zipper goes all the way down. The daughter of Walter Hardy, renowned cat burgular, Felicia has trained to become an expert in escape, lock-picking, safe-cracking and security systems. There may be a couple others on the planet who are better than she is at any one of these, but she is very, very good at what she does. Felicia was an accomplished cheerleader and gymast in school. Her thrill-seeking attitude combined with her enhanced strength and reflexes allow her to perform stunts that would make most professional aerialists hesitate to follow. Felicia has trained extensively in martial arts, primarily in karate and judo. She's not exactly world-class in her skill, but she fights regularly enough to keep at the top of her game. Combined with her strength and reflexes she is skilled enough to fight her way through half a dozen armed guards and escape without a scratch. With her enhanced agility and senses, Felicia is a master of stealth. She's good enough to be able to come and go discretely enough to fool normal senses and occasionally fool enhanced senses. Her expertise in picking locks combined with her enhanced reflexes and even her bad luck power makes it very, very difficult to keep Black Cat confined if she doesn't want to be. If she can't pick a lock or wriggle out of handcuffs, things often break improbably (My handcuffs are broken! Bad luck for you…). Felicia grew up wealthy and thanks to her burgulary 'hobby' she remains that way. As such, she was raised with the proverbial 'silver spoon in her mouth'. Felicia attended the best schools, knows all the 'right' people in New York, and gets invited to prominent social gatherings. Felicia graduated from Liberty University with a degree in Art. While she's not a skilled artist, she knows what to look for in order to tell most original works from copies. Felicia steals for many reasons, and few of them have to do with money. Mostly she likes to have nice things in order to fill a deep-seeded emotional void. But regardless, she can never truly get enough. Black Cat has made more than a few enemies throughout her illustrious career as a cat burgular. From competitors to victims, there's a pretty extensive list of people who would love to shut her down. The Black Cat has a criminal record in New York, although she's never been captured and booked. The NYPD is always looking to match up high-end burglaries to her particular style. 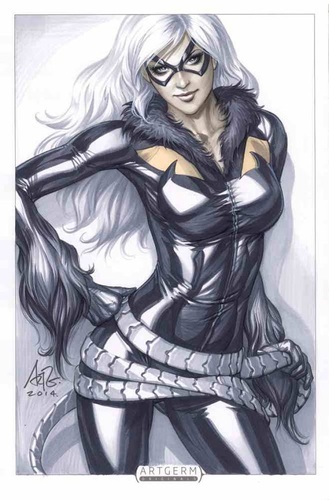 Almost no one knows that Felicia Hardy is the Black Cat, and she wants to keep it that way. With so many people after her noctournal alias, protecting her name is absolutely essential to such a public person as Felicia. While Black Cat's 'bad luck' probability manipulation comes in pretty handy, there are some definite side effects. The biggest side effect applies to anyone who spends regular time in her company. Quite simply, they tend to attract her bad luck probability on an increasing basis. Felicia's control over her probability aura is pretty good, but she's also proof positive that you can have too much of a good thing. And as such, she's very careful not to get too close to any one person. Felicia Hardy is the daughter of Walter and Lydia Hardy, a couple of New York socialites. Although her father has passed away and her mother has become reclusive, Felicia is very gregarious on her own. She knows all the 'right' people in New York, gets invited to all the prominent social gatherings, and is making quite a name for herself. The Black Cat is a notorious cat burgular in New York City and along the Eastern seaboard. And while he/she continues to elude the authorities, his/her methods are fairly well-known. Dispite substantial rewards being offered, the Cat remains at large.